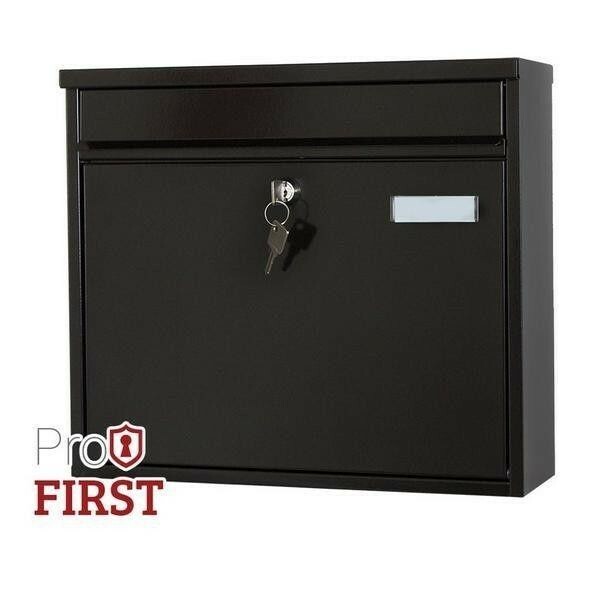 The Pro First 120 Black Mailbox is specifically designed to be used for a house or apartment. The 120 offers a slim design which allows multiple post boxes to be fitted side by side, above and below one another in rows. Made from high quality steel, it is secured by a key Lock which is supplied with two keys. Pro First 120 Black Steel Mailbox. Suitable for flats, apartments and all other multiple occupancy residences. Can be seated sided by side, above or below one another. Front loading A4 letter slot with roof flap. Mail can be removed via drop down door. Door includes a name plate window. Made from high quality steel. Suitable for wall fixing (fixing screws included). Also available in Stainless Steel. © 2018 The Mailbox Shop. All Rights Reserved.